The Peavey PVi 8500 and PVi 6500 are 400-watt powered mixers that combine exclusive Peavey innovations, the Peavey legacy of quality and reliability, and modern amenities such as an input dock for iPhone® and iPod®. Eight combination XLR and 1/4" inputs (six on the PVi 6500) based on Peavey high-quality, low-noise Silencer® mic preamps provide versatility and clear audio reproduction, while Peavey's proprietary Mid-Morph® EQ control improves the tone and clarity of vocals and complements the low and high EQ bands by boosting high-mids or cutting low-mids. Both models feature a nine-band graphic EQ that is assignable to the main or monitor output and features Peavey's patented FLS® Feedback Locating System, which makes accurate feedback elimination simple and intuitive. Exclusive Peavey Kosmos®-C technology provides spectrum enhancement to both the low and high end of the frequency range, while the footswitchable 24-bit digital effects section includes multiple varieties of rich, highly detailed reverb and delay. Dual power amplifiers provide 400 watts total, with independent level control and parallel (main and monitor outputs) or stereo (both amps on main output) operation. Users can connect virtually any audio device to this versatile mixer via the onboard 1/4", RCA and 1/8" mini jacks. 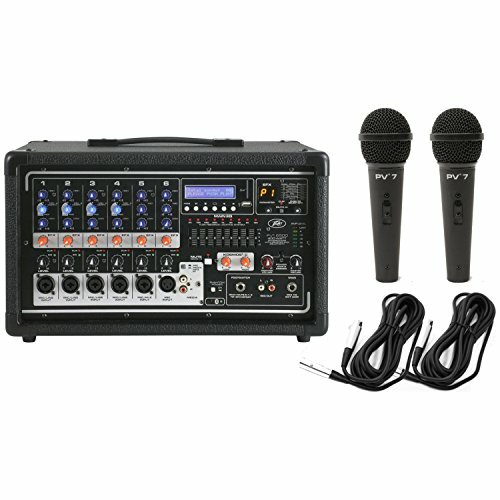 Bundle Includes 2 Mics and Cables!